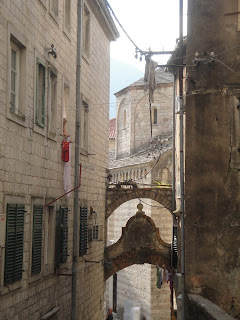 Our first stop in the tiny country of Montenegro was Kotor. Located right in the largest (false) fjord in southern Europe, the old town was idyllic. Narrow streets, stonewalls, and pedestrian area zones: what’s not to like? After checking into our hotel, BH and I made our way up the fortress the looks out onto the triangular old town. The views during the climb were remarkable, but so was the amount we sweated. Although we were climbing in the evening, the sun was still pounding on our backs as we made our way past the old church. At this point, we were only a third of the way up yet had probably lost a couple of kilograms of water weight. Continuing up our climb, many people encouraged us / warned us that there would not be any water at the top. Luckily we had brought a couple of water bottles. We finally reached the top, but were panting like crazy. We have been carrying around these backpacks for three weeks­— you’d think by now we’d be in better shape. The ascent was worth it though. From the top of the fortress, you could see all of the old town, the fjords, and the mountains to the east. Beautiful. I was really excited to see fjords for the first time in my life, but apparently they were not made glacially so they don’t fill all the criteria. As you can see, that doesn’t take away any of their natural beauty.